Any excuse for a party? Well, we’ve heard better reasons for pushing the celebratory boat out than the second anniversary of the promoters from one achingly hip Shoreditch venue taking over the bookings at that other East London outpost the Sebright Arms. But if someone’s putting 100 free pints behind the bar and filling the pub’s underground concrete bunker of a live room with balloons then you certainly won’t find this reviewer pooping any plans for a knees-up. 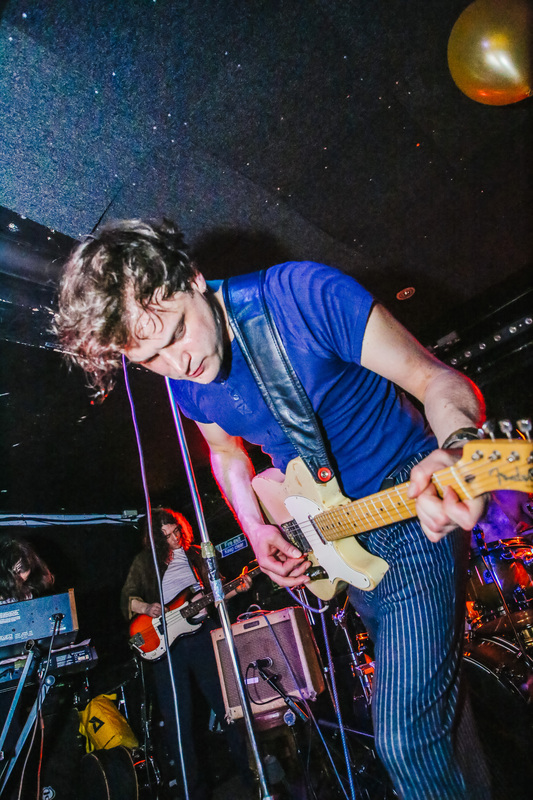 Especially if said celebrations involve South London’s six-piece Phobophobes putting in an appearance, They’re an obvious fit for the role, what with their ranks featuring an original member of Fat White Family and a sometime member of Meatraffle too. One look at the band as they head on stage, their twin keyboard players resembling (left) a Captain Beefheart lookalike competition winner complete with drooping mustache and (right) the president of the Milton Jones dress sense fan club, they appear to scream the word hipster in capital letters. But tonight it feels like they’ve come less to praise hipster culture than to bury it, or at the very least bid it a fond farewell before they embark on their second album, reputedly recorded in Spain with Killing Joke bassist and superproducer Youth at the helm. Their assured performance tonight feels like an indication that they’re headed for bigger things beyond cult status in certain pockets of London. Their stripped-to-the-waist drummer Nathan Ridley counts them in and quickly demonstrates that he’s the centrifugal point that the band’s tornado swirls around, a provider of rock solid and compulsively violent rhythms that the rest of the band can hang off with comfort and ease. Singer Jamie Taylor, meanwhile, has evidently honed his skills over the past two years of constant gigging to become the epitome of the magnetic frontperson. He doesn’t say much, with the kind of almost intimidating reserve that brings Specials frontman Terry Hall to mind, often lost in his own private world of thought mid-song, booming the words with a dislocated and highly distinctive tone that could be David Byrne transposed downwards an octave. There’s nothing casual, either, about the way they execute the songs in their arsenal, plucked almost exclusively from their recent Miniature World masterpiece with three new songs (‘Mustache Mike’, ‘Blind Muscle’ and ‘The Negative Space’) thrown in. They know how to manipulate the crowd’s mood, switching down to the excellently wonky stride of ¾ workout ‘Free the Naked Rambler’ halfway through, before tweaking their sensibilities back to life with the T Rex-slanted friskiness of ‘Human Baby’, even if there’s no Will Self on hand to provide its intro. The effortless precision with which they dispatch tracks like ‘Never Never’ and ‘Where Is My Owner?’ gives plenty of room for Taylor’s lyrics to poke through the maelstrom, painting a developing picture of disillusion and disorientation in the face of modern living. It’s a world away from – or more likely the darker flipside to – the garishly attired blind confidence of hipsterdom. They end with the exquisitely brutal glam stomp of recent single ‘Child Star’, probably their darkest moment yet, the keyboards alternatively adding layers of distorted Wurlitzer noise and high-frequency Moog madness. If this is any indication of what lies in store on their second long player then all the signs are that it’ll be a proper corker. Now that’s something that really is worth celebrating.